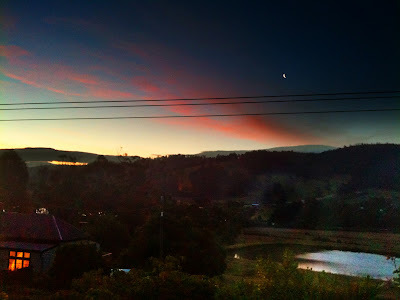 I really love the colours of the setting sun from my place, especially when there's a bit of a moon involved too. This is the view from my porch one night this week. I love my iPhone for quick photography, because I've never taken the time to learn how to use Mr S' fancy SLR. This is taken with an HDR app and edited oh so quick and dirty in Photoshop.